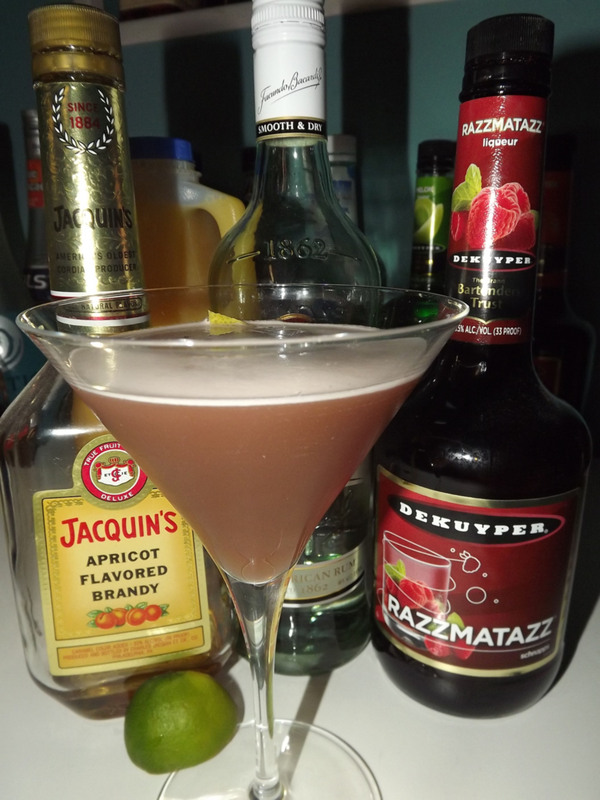 Well as we continue on blended cocktail week there was bound to be a drink that isn’t exactly perfect. 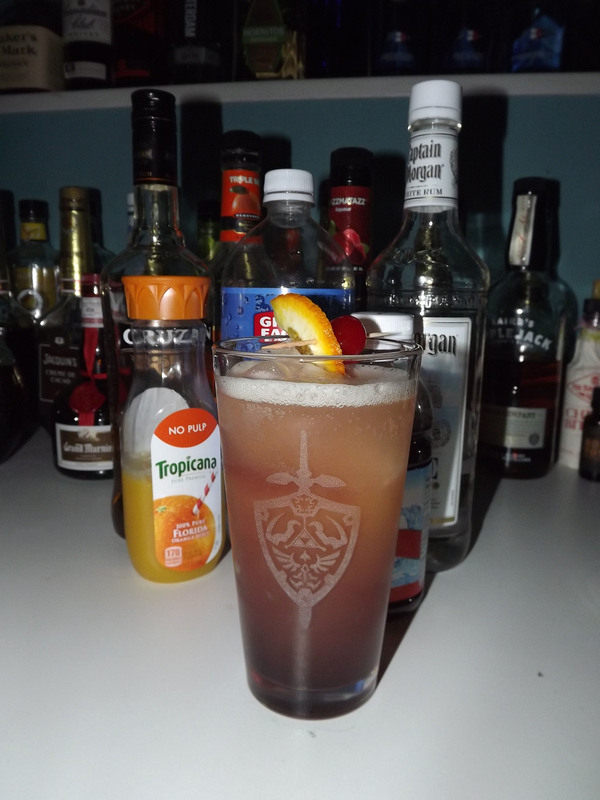 Now the “South of France” is still a very good drink, but the flavor is certainly more interesting than anything. A pleasant and inviting drink as it is resembling in taste and look to that of the “Pina Colada,” this cocktail however has a slightly more complex flavor thanks to the B&B. 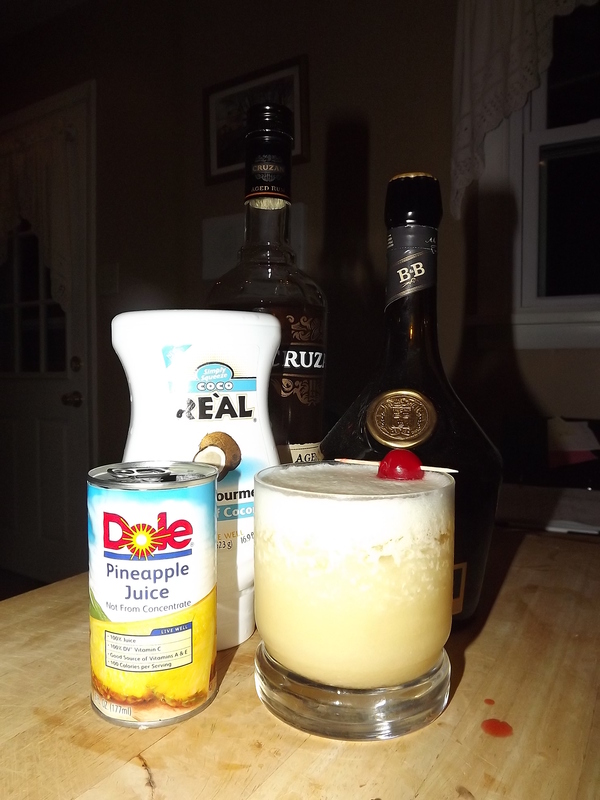 Once you drink through the frothy pineapple foam, the drink starts you off sweet and rummy. The drink then moves to a pure pineapple, and finishes with the interesting mix of pineapple and coconut with a strange herbal taste mixed in underneath. This certainly isn’t my favorite blended drink but it is still very good. I’d be interested in how this drink would taste with a pure Benedictine. Possibly one of the more interesting names for a drink I’ve come across and it certainly didn’t disappoint on taste. The Sassafras Sunset has a pleasant citrus aroma and starts with an equally light citrus flavor with a bit of fizz. Mid palette it hits you with a nice juicy mix and finishes off with a mild rum and hit of raspberry. The shift in flavors in this drink are exactly what I like to find in a drink, and the addition of club soda makes this a perfect drink for any occasion. The taste of alcohol in the drink in minimal sitting at around 3/10 and overall it’s a solid 7/10. I do wish the juice and club soda was a bit more balanced, but that is something that can easily be tweaked depending on which type of tall glass is used. Shake Rums, triple sec, and juice ingredients with ice. Strain into an iced pint or highball glass. 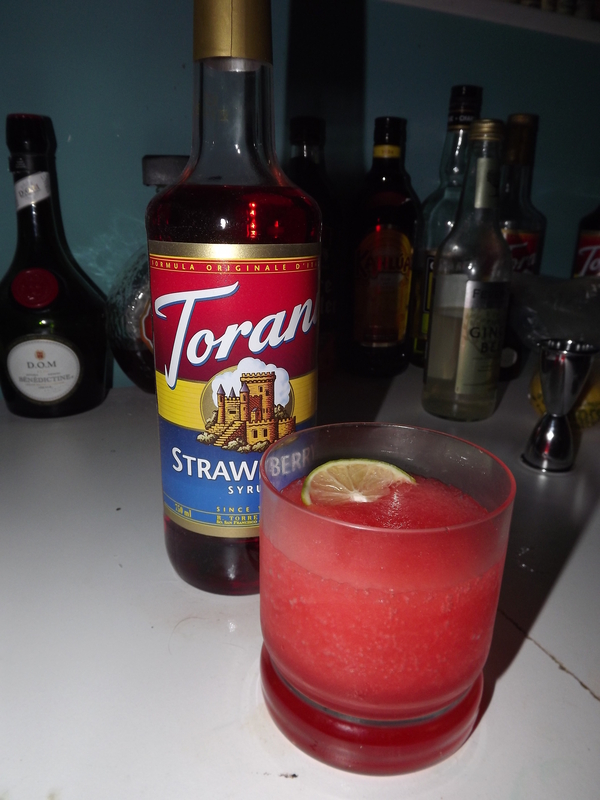 Top with Club soda and float raspberry liqueur (sinks to bottom). Garnish with an orange slice and a cherry. Well, my vision for this drink a “core sample” of an alcoholic watermelon. Green floating over pink working our way to the juicy and sweet red center. I was recently leafing through my cocktail book when I remembered the “electric watermelon” that I featured back in May. This however I designed to take on both flavor and the appearance of watermelon. 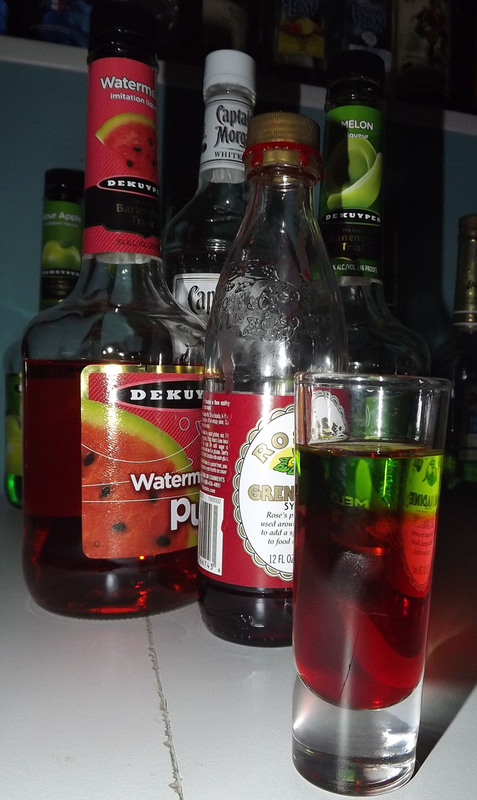 Granted the green is on top, how ever that could easily be rectified by mixing the melon liqueur with simple syrup on the bottom (1/4 oz each to make a 1/2) and topping it with a mix of the 1/4 oz of rum and 3/4 of pucker. Today though we’ve got our core sample of the Lil’ Watermelon. Layer in order in a tall double shot glass. OR half all ingredients in a standard shot. Today we get our first taste of fall (although the start of the season is still a few weeks off). 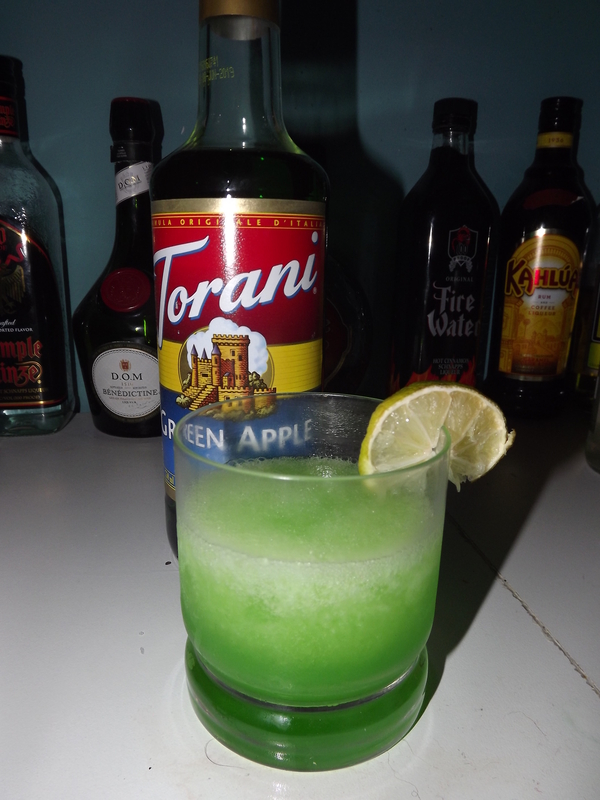 The apple swizzle highlights a new ingredient in my bar “apple brandy.” Now my recipe for this drink calls for an iced highball glass, although given the small size of the drink I feel anything bigger than a lowball or tumbler will make the drink seem silly and out of place a bit. 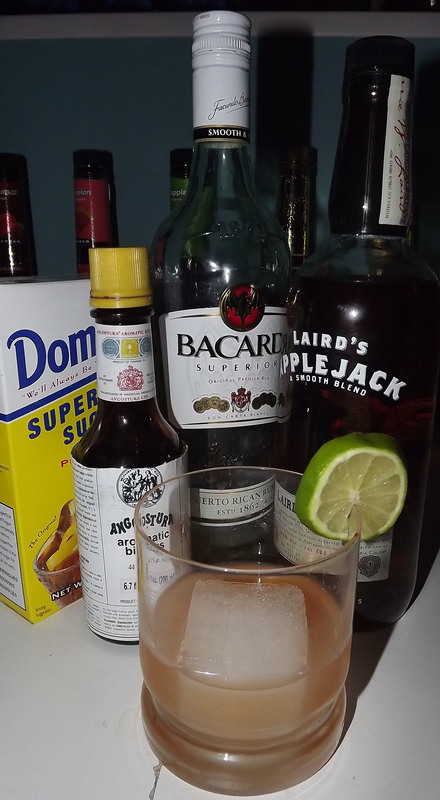 The drink is characterized by a tan color and smells mildly of apples, but leans closer to a bourbon smell (this could be use of the applejack as it is made primarily with neutral grain spirits). The drink starts on a mild sweet then moves the a slight rum and bitters burn. The apple brandy comes through in a lingering aftertaste which makes you go back for more. If you have some apple brandy around or are thinking of picking some up this season, you may want to give this one a try. Just be sure to go easy on the bitters (or be wise about which ones you use). This is one drink where they can be overpowering. I do wonder how different this drink would be with some cherry bitters to liven up the harvest. Straight build over ice in a tumbler. Stir well and garnish with a lime slice.